AquaPill is a unique line of specialty pool chemicals, for residential and commercial pools, in a patented, time-release delivery system. 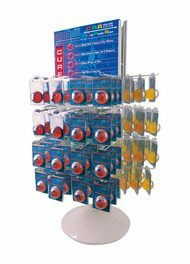 The specialty chemicals are contained in pre-filled, ready-to-use plastic capsules that are placed directly into the pool or skimmer basket, without any mixing or measuring. As water circulates, the chemical slowly disperses into the water to treat the pool. Designed to maintain the appearance and quality of pool water, the AquaPill line has products to treat a wide range of pool applications, such as clarifying, algae removal, stain and scale removal, winterizing and pH maintenance. Regular use will ensure sparkling clear water. 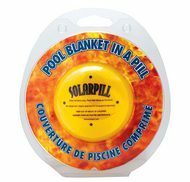 Solar Pill #M-AP73 (Treats up to 12,000 gallons) - Pool Blanket In A Pill - Easy-to-Use. Prevents heat loss and water evaporation with an invisible layer of non-toxic, bio-degradable film. Works like a conventional solar blanket without the hassle. 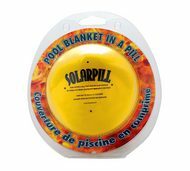 Solar Pill #M-AP72 (Treats up to 30,000 gallons) - Pool Blanket In A Pill - Easy-to-Use. Prevents heat loss and water evaporation with an invisible layer of non-toxic, bio-degradable film. Works like a conventional solar blanket without the hassle.